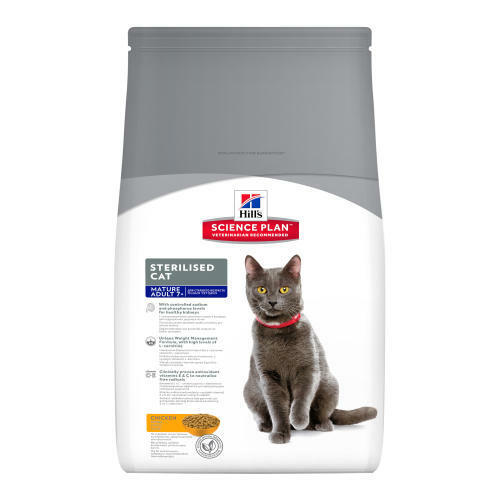 Hill's Science Plan Feline Sterilised Cat Mature Adult Chicken is tailored to meet the needs of sterilised cats. Formulated with clinically proven. Sterilised cats are over three times more likely to become overweight and suffer with urinary problems. Unique WMF (weight management formula) to burn fat and build muscles. High levels of antioxidant vitamins E&C to help preserve healthy kidneys. Chicken (30%): Maize, rice, poultry meat meal, maize gluten meal, digest, animal fat, fish oil, potassium chloride, calcium carbonate, vegetable oil, salt. Beta-carotene 1.5 mg/kg, Calcium 0.0085, Carbohydrate (NFE) 0.461, Fat 0.096, Fibre (crude) 0.011, L-Carnitine 470 mg/kg, Magnesium 0.0007, Moisture 0.055, Omega-3 fatty acids 0.0058, Omega-6 fatty acids 0.0239, Phosphorus 0.0069, Potassium 0.0086, Protein 0.322, Sodium 0.0035, Taurine 2260 mg/kg, Vitamin A 4550 IU/kg, Vitamin C 70 mg/kg, Vitamin D 435 IU/kg, Vitamin E 550 IU/kg.